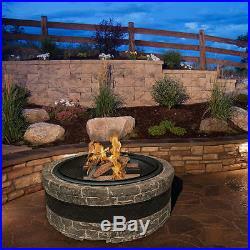 Cast-Stone Fire Pit (Charcoal Gray). Linger a little longer around the fire while family and friends gather in the warmth and glow of the Sun Joe® Fire Joe 35-inch cast-stone fire pit (model SJFP35-CS-STN). Keep the chill in check in style and comfort. Fire Joe is an ideal outdoor centerpiece, wherever warmth is neededfrom the patio to poolside, from deck to dock. Featuring a large 29-inch fire bowl that is heat-resistant to 1,112° F, the Sun Joe® Fire Joe can accommodate hardwood logs up to 21.5-inches long. 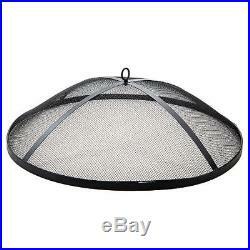 The 24-inch hook helps you tend logs and remove the mesh screen from a safe distance from the flames. Boasting a durable and visually appealing cast-stone base, Fire Joe adds a sophisticated touch that will last from season to season. A wood grid facilitates circulation and improved airflow to feed the flames, while the screen guards against escaping sparks. Youll run out of spooky stories and smores long before you run out of reasons to fire up this cozy family favorite. 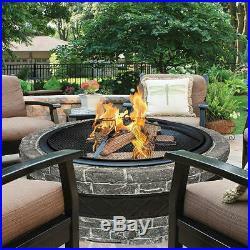 Ideal outdoor centerpiece for warmth and enjoyment. Durable cast-stone base adds a sophisticated touch to any outdoor décor. 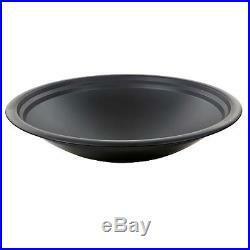 (73.8 cm) fire bowl accommodates hardwood logs up to 21.5 in. (54.6 cm) long. Wire mesh screen protects against sparks and provides an open view of the fire. 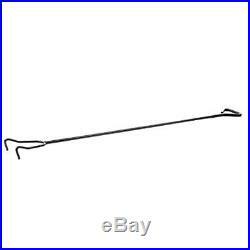 (61 cm) screen hook included for safe removal of screen while the fire is burning. WARNING Many food and beverage cans have linings containing bisphenol A (BPA), a chemical known to the State of California to cause harm to the female reproductive system. Jar lids and bottle caps may also contain BPA. You can be exposed to BPA when you consume foods or beverages packaged in these containers. L 35 x W 35 x H 13. Your product should leave the warehouse within the time specified in this listing. WE ARE NOT ABLE TO DELIVER TO P. Thank you for your reading this notice and consider. I felt it necessary to include this information to all my listings due to buyers NOT reading the terms of my listings. We are trying to describe our products as accurately as possible. However, we do not warrant that product descriptions are accurate, complete, reliable, current, or error-free. In the event a product is listed at an incorrect price or with incorrect information due to a typographical error or an error in pricing or product information received from our suppliers, we might have the right to refuse or cancel any orders placed for products listed at the incorrect price. Please advise us immediately if it accurate. AL, AK, AS, AZ, AR, CA, CO, CT, DE, DC, FM, FL, GA, GU, HI, ID, IL, IN, IA, KS, KY, LA, ME, MH, MD, MA, MI, MN, MS, MO, MT. NE, NV, NH, NJ, NM, NY, NC, ND, MP, OH, OK, OR, PW, PA, PR, RI, SC, SD, TN, TX, UT, VT, VI, VA, WA, WV, WI, WY. Pharmacy, Health & Beauty. Jewelry, Flowers & Gifts. Household Essentials & Pets. Outdoor, Patio & Garden. The item “Sun Joe 35-in. 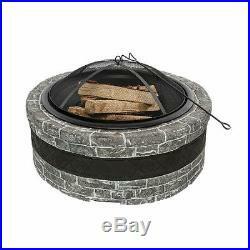 Cast-Stone Fire Pit (Charcoal Gray)” is in sale since Saturday, August 4, 2018. 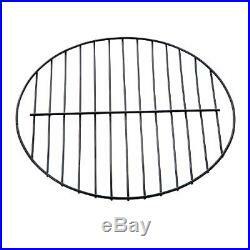 This item is in the category “Home & Garden\Yard, Garden & Outdoor Living\Patio & Garden Furniture\Outdoor Furniture Covers”. The seller is “edabukletbyadshoez” and is located in Multi-State Warehouse / Distributor. This item can be shipped to United States.